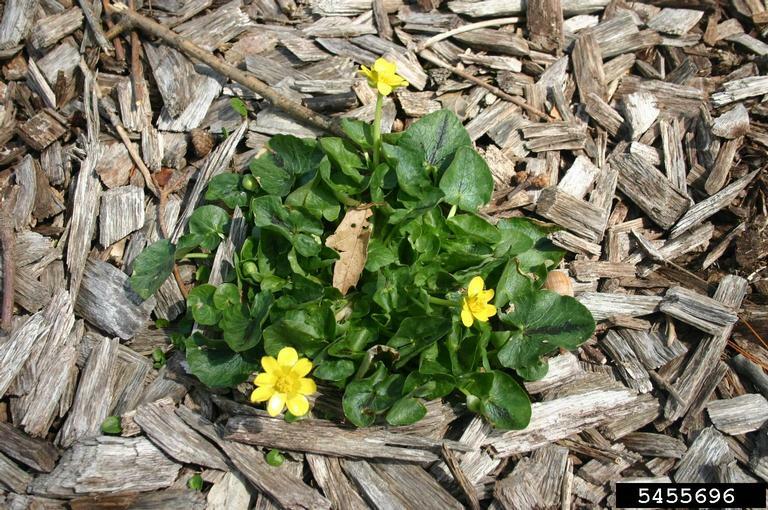 Ficaria verna | Lower Hudson Partnership for Regional Invasive Species Management. Lesser celandine flowers in early spring with 3 green sepals and 7-9 yellow petals. 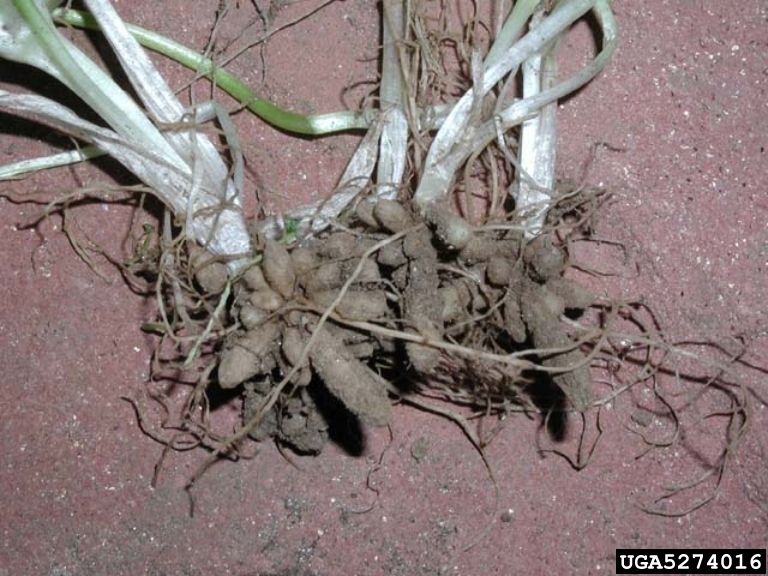 One of the key ID characteristics is the presence of small tubers along the roots. Lesser celandine invades along streams and in wet areas. Lesser celandine forms dense rosettes and spreads via root tubers. 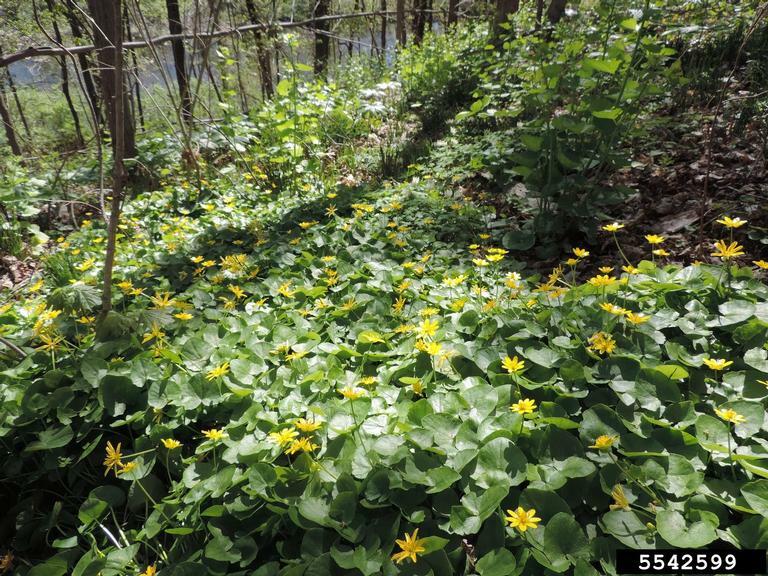 Lesser celandine reduces native species diversity in flood plains and lowland woods. Its early emergence and extensive network of tubers and roots in the soil allow it to outcompete native plant species. During the spring, lesser celandine forms dense mats, occupying space and competing for sunlight and nutrient resources. Lesser celandine is native to Europe, Asia, and northern Africa and was likely introduced to the United States as an ornamental plant. 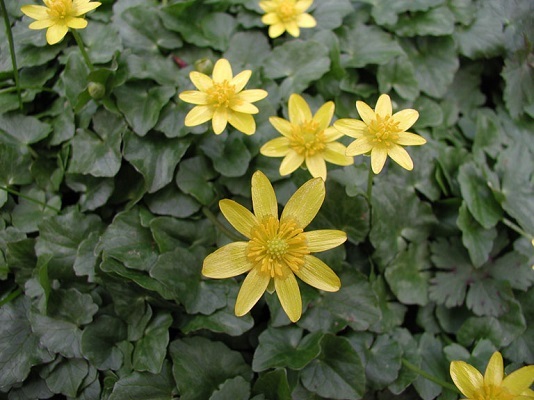 Lesser celandine is distributed widely and well established in the Lower Hudson Valley and its possession with intent to sell, import, purchase, transport or introduce is prohibited in New York State. In the Lower Hudson Valley, lesser celandine inhabits riparian forests, river banks, and disturbed areas. It is usually found in wet areas, but has occasionally been found in lawns and edges of trails. Lesser celandine is a spring ephemeral, emerging in the early spring and becoming dormant by early summer. Its emergence is triggered by increased light availability. Shoots emerge during late March or early April depending on yearly environmental conditions. Flowering is likely dependent on water availability, occuring from April to mid-May. Seeds are produced during late spring before the above-ground vegetation dies back and becomes dormant in the early summer.